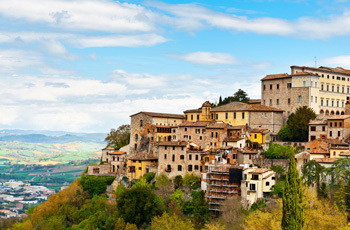 Spend a week immersed in the bucolic ambience of Umbria and the next in magnificent Rome! One week each in personally selected apartments in Umbria and Rome. Umbria: Car rental, with unlimited mileage and basic insurance. Transfer between destinations: Directions for your independent drive and rental car return at the Rome airport, private driver transport from airport to your Rome apartment. Local info, driving map, and Untouring Rome and Untouring Umbria guidebooks, researched and written by Untours staff, full of insider tips and sightseeing suggestions. Cultural events in each location, like a castle tour in Rome and a tour of an Umbrian farmstead, including a home cooked meal with its owners.